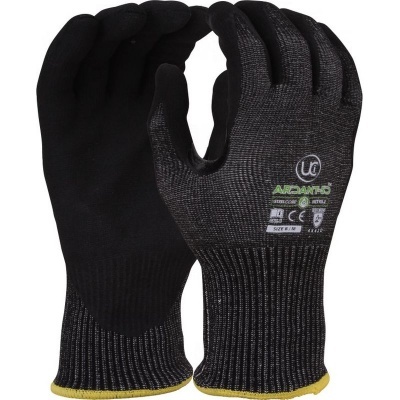 For high risk environments you need tough gloves to ensure safety, which is why the Ardant-5D Microfoam Palm-Coated Cut-Resistant Gloves utilise a steel core to provide excellent cut resistance. This is supported by a specially engineered yarn that wraps around the steel core, which works to provide outstanding comfort and breathability. The palms of the gloves are coated in microfoam, meaning that hands stay protected and grippy when working in the wet and with oil. The Ardant-5D Microfoam Gloves are available in four sizes that should suit the hands of most users. Please measure the circumference of your hand around the knuckles (excluding the thumb) with your hand open and your fingers together, and the length of your hand from the tip of your middle finger to your wrist.